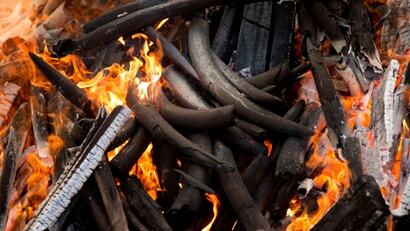 It had the makings of a media sensation: "Scores of dead elephants", their brutalised corpses rotting in plain sight. Victims of a poaching crisis spiraling out of control in the last African stronghold — perhaps as a result of the government's recent decision to de-militarise wildlife patrols. And yet this story — the story of 87 elephants killed in a recent "poaching frenzy" in Botswana — has become more and more dubious ever since it was broadcast across the world (including by Gizmodo) several weeks back. The government of Botswana has categorically denied a recent mass elephant slaughter within its borders. Wildlife biologists working in Botswana say the claim doesn't match the evidence. And a human rights NGO suggestedElephants Without Borders — the group behind the viral story — may be promoting a false narrative to encourage greater militarisation of the country's conservation infrastructure. At the same time, some experts have voiced concern that poaching could be ramping up in Botswana in a way the country hasn't seen before. Gizmodo has reached out to Elephants Without Borders by phone and email, and we've yet to receive a response. In a statement the organisation published on September 20, Elephants Without Borders said it "felt it a moral and patriotic duty" to report what it had seen and was "deeply saddened" by reports portraying the issue as political. The backstory here is that Elephants Without Borders was contracted by the Botswanan government to carry out an aerial survey of elephants across the country's northern tier from early July through the end of September. But after reportedly sighting nearly 90 dead elephants with their tusks hacked off — including 48 carcasses in a single day — Mike Chase, the lead survey scientist, felt compelled to make his findings public. "The scale of elephant poaching is by far the largest I've seen or read about anywhere in Africa to date," Chase told the BBC. The paper noted that many of the animals appeared to have died within the last few weeks. The BBC tied the alleged spike in deaths to the "disarming" of the country's anti-poaching unit. Shortly after Mokgweetsi Masisi took over as president of the Botswana in April, rangers with the Department of Wildlife and National Parks were told to stop carrying military-style assault rifles, which they had been doing illegally. Initially, Botswanan tourism minister Tshekedi Khama said he was "very concerned" by the reports of a poaching spike, calling it a "huge worry." "I'm aware that the numbers are in double digits, and for Botswana they are high," Khama said, according to the AFP. But the day after the story broke, the government of Botswana fired back with a statement slamming media reports as "false and misleading." "At no point in the last months or recently were 87 or 90 elephants killed in one incident in any place in Botswana," the statement reads. The government added that Elephants Without Borders had reported 53 carcasses between July 5 and August 1, and that verification missions had already established the majority "died from natural causes and retaliatory killings as a result of human and wildlife conflicts." It's important to note the government response rebuts the idea of a single mass poaching incident — which Elephants Without Borders did not claim — rather than a recent uptick. And it doesn't cover the month of August, which, per the BBC's account, is when many of the animals Chase said he saw appear to have died. But even if Chase's August surveys turned up more than 30 additional dead elephants, there's still a question of how those animals died. Aerial surveys alone can't necessarily determine whether an elephant was killed by poachers, during a conflict with locals, or old age, according to Stephen Corry, director of the tribal rights organisation Survival International. Especially not in Botswana, where the Defence Force is liable to remove tusks no matter what. "If elephants die naturally, if the wildlife guards come across the carcass they will remove the tusk," Corry told Gizmodo. "Elephants killed by people defending their crops [or] houses might also have their tusks removed. In other words if the total number of carcasses you've seen is 87, the assertion that 87 have been poached recently cannot possibly be true." Kathleen Alexander, a veterinarian and wildlife professor at Virginia Tech who runs a conservation NGO in northern Botswana, agreed that 87 carcasses spotted does not mean 87 elephants poached. And she took further issue with Chase's remark to the BBC that the scale of poaching was the "largest" seen anywhere in Africa, even going so far as to pen a response with several colleagues laying out why this was misleading. "We looked at Mike Chase's own data," Alexander said, referring to the Great Elephant Census of 2015, which Chase led. That census, she pointed out, turned up 340 and 288 fresh elephant carcasses in Angola and Mozambique, respectively. By comparison, 87 dead elephants — even if they were all fresh carcasses — can hardly be called the largest number ever seen. Alexander also pointed Gizmodo towards data compiled by CITES, which shows nearly two dozen locations across Africa that have seen 87 or more illegal elephant killings in a year. "I still don't understand it," she said. Last week, the Botswanan government shared the results of an on-the-ground investigation it conducted in wake of the viral story. Officials' visits to Chobe National Park — the sight of the alleged slaughter — turned up just 19 elephant corpses, of which six appeared to have been slain by poachers, according to findings wildlife officials shared with the media last week. Richard Thomas, a spokesperson for the wildlife trade NGO TRAFFIC, said he didn't have much to add to the story. "It would be helpful if there was absolute clarity over whether the corpses are indeed of animals poached for their ivory, or they died for some other reason," Thomas told Gizmodo. "[I]f the total number of carcasses you've seen is 87, the assertion that 87 have been poached recently cannot possibly be true." There's no question elephant poaching is a serious problem across Africa. In 2016 the International Union for the Conservation of Nature estimated there were approximately 415,000 elephants left continent-wide, and that 111,000 had been lost in the previous decade, largely due to poaching. Botswana is home to more of those remaining elephants than any other African nation — an estimated 130,000. And recent controversy aside, there have been warnings of more poaching creeping into the country as elephant numbers plummet elsewhere, according to Ross Harvey, a researcher at the South African Institute of International Affairs. "I would say that regardless of this recent furor, I'd have predicted on the grounds of scarcity and geographic location and the trends across the continent that Botswana was going to get nailed at some point," Harvey told Gizmodo. Harvey added that poachers may find it easier to exploit locals in Botswana since the government banned trophy hunting, a source of revenue for some communities, in 2014. (The new president is reconsidering that decision.) Ivory trade expert Keith Somerville made a similar suggestion back in 2015. Harvey wasn't sure what to think about the poaching frenzy story, noting that Botswana has managed its elephant population "very well" on the whole. But he didn't think there was a simple link a poaching uptick in Botswana and the government's decision to "disarm" wildlife rangers, as the BBC report and others suggested. Alexander pointed out that rangers are still allowed to carry high-calibre weapons, and that the Botswana Defence Force constitutes the bulk of the country's anti-poaching manpower, anyway. They remain heavily armed. This narrative was also troubling to Corry, who described the notion that wildlife guards must remain armed to the teeth as "fortress conservation." In addition to taking assault weapons away from rangers, Botswana recently ended its unofficial "shoot to kill" policy for suspected poachers — a policy which has been linked to violence against tribal peoples. "This whole concept of fortress conservation, which is now gaining a lot of traction and has been pushed very hard by the conservation organisations, is widely hated in Africa," Corry said. "It is viewed as colonial, detrimental to people, and often to animals and the environment." Corry wondered whether Elephants Without Borders went public with its preliminary findings in order to shore up support for harsher anti-poaching tactics. While the organisation's recent statement suggests that wasn't its intention, one outcome of the story has indeed been a surge of international interest in protecting Botswana's elephants — by whatever means necessary. "Whatever anybody says now — and almost nobody has countered this — the damage is done," Corry said. "People have it lodged in their heads that there's yet more poaching, [so] we better step up and do more."